A program volunteer is a “hands on” assistant to Youth Challenge participants. Volunteers are paired one-on-one with a YC partner at each activity and do what is needed to best meet the physical and personal needs of participants. A program volunteer reports directly to the Director of Volunteer Services and other Program Staff and serves at their discretion. See below for more ways you can help! If you have any questions or would like to get involved, contact Director of Volunteer Services, Sarah Perez-Stable at sperez-stable@youthchallengesports.com or call (440) 892-1001. Create and implement a game, party, carnival or art project for the participants. Past activities include holiday parties, mixers, teen nights and mini camps. Prepare or provide food and juice for children’s snack time. Help raise funds. Hold a bake sale, organize a pop-tab drive, get friends and family to sponsor you for every point you make during your team’s season, or think up another fun way to help support Youth Challenge. No gift is too small! Help us wash our fleet of lift-equipped vans or keep our gym floor squeaky clean. Bring in your group, grab a bucket, and get ready to work! Donate new or slightly used items to YC. We are always in search of small gifts of thanks for volunteers, prizes for children to be given at various activities, and Wish List Give us a call if you have something to bring in! Help out behind the scenes or with the kids at programs as they try their hand at a new sport. You can help coach a game, run an activity, lead us in song, and much more. BE CREATIVE! Do you have another way your group might be able to help out? LET US KNOW! Transportation for participants is an important service at YC. Volunteer Drivers are needed year-round to help participants get to and from programs. Schedules are flexible! Volunteer Drivers can determine which day and times they’d like to work. Before a Volunteer Driver can get behind the wheel, they must first go through an interview and training process with YC staff. Volunteer Drivers must also have a clean driving record and submit a background check. Please contact Youth Challenge if interested in this opportunity. YELP is a series of classes and programs that comprised of participants age 16 to 25 who currently attend or have graduated from regular Youth Challenge programs. 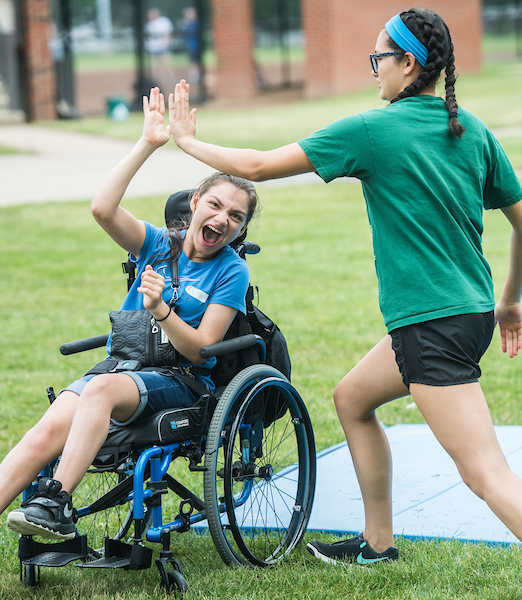 These sports, service and social activities are a great way for young adults with physical disabilities to stay active and involved while increasing their independence. Adult Volunteers are needed at these evening and weekend events to help and to mentor club members. Volunteer training is required. Provide assistance in the Youth Challenge office with various clerical duties, including answering phones, database work, bulk mailings and more. Opportunities available throughout the year. Assist van drivers along their route of picking up and/or dropping off YC participants before and/or after a scheduled program. Help to provide an atmosphere of safety and fun during the trip. Opportunities available during the summer for veteran volunteers.